Believe it or not, it is possible to vacation in Maui on a budget. While your normal holiday expenses may need to be adjusted to the island’s cost of living, there are plenty of ways to cut spending, and better yet, not spend any money at all. If you are thinking about a trip to Maui, a little planning can ensure you get the most out of your budget. Let’s take a look at what Maui offers without paying a penny! It’s Always Free to Look! Maui is no different and just like any other place in the world, if you want to walk a trail or stroll around a local village it’s completely free to do so. 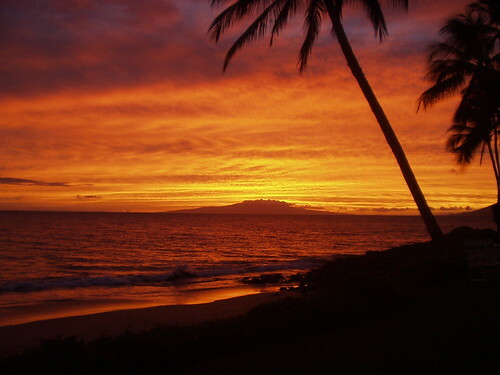 The scenery, the culture and the overall grandness of being on the island of Maui is completely free of charge to indulge in so make sure you take advantage of it all (the above sunset is the perfect illustration of this concept). If you decided to hire a car during your stay, you should check out the incredible 8 mile cliff drive: take the Honopiilani Hwy continue north past Kapalua. Drive by Kahakuloa village and on the road up the hill out of the village. There are also a ton of nature trails you can spend the day hiking and exploring. There are some great hidden coves to discover down by the sea or up into the hills at Kapalua. You can walk around historic Lahaina, browse the coffee plantation (possibly even get a free sample of homegrown coffee!) and even catch a local hula performance at Lahaina Cannery Mall while you’re in that area. Maui also has a nice selection of admission-free museums and historical buildings such as Hale Kahiko (three Hawaiian houses) and Whalers Village. Just because Maui is a popular tourist destination that doesn’t mean your wallet needs to be taken advantage of. There are plenty of ways you can save money on your island excursions by taking advantage of all the free ones available. Beaches are the perfect way to spend your day and let’s not forget about all the free things to do there: Swimming, sunbathing, sandcastle building, local hula dancing, and if you bring your own supplies, you could even go surfboarding and play beach sports for free as well! (Some hotels offer even more – so it pays to ask the front desk or concierge for options.) You can also save money on those overpriced whale watching tours and catch a glance of those majestic creatures from the shore. Honopiilani Hwy between McGregor Point and Olowalu is a great place to go wildlife spotting. Even if you may not catch a whale in action, you can always stay for the sunset and I’m sure that will make up for it. Which brings to mind that watching sunsets are free as well, so what better way to spend your evening than relaxing in front of a better-than-picture-perfect sunset that Maui provides?